I’m happy to report that with a bit of searching and testing it’s been possible to put together a nice collection. 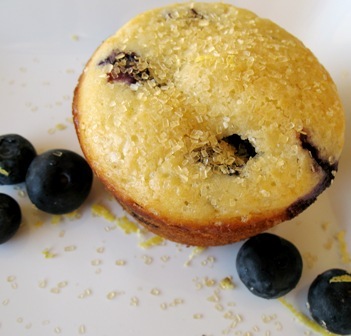 Lemon-Blueberry Muffins (4 Weight Watchers™ Points each) – I love muffins because they are easy to make, portable, and freeze well. In a pinch, a boxed muffin mix will do, but I much prefer to make them from scratch so I know exactly what is in them. This recipe whips up quickly, particularly if you use a food processor to cut in the butter instead of doing it by hand. These aren’t super-sweet muffins. Instead, they let the blueberries really shine through. I top mine with raw sugar instead of the glaze because I like the extra crunch it adds. Wrap individual leftover muffins in aluminum foil and freeze in a zip-top bag. Reheat in a 425 degree oven for 20 minutes for an easy weekday breakfast. Blueberry-Almond French Toast Bake (5 Weight Watchers™ Points per serving) – If your family likes French toast but you’d like to serve them a lighter version, this recipe is perfect. You get the custardy goodness of French toast without all of the calories and fat. As a bonus, you make it the night before and slide it into the oven the next morning to bake. All you need to finish breakfast is a side of fruit and maybe some turkey sausage or ham. The recipe halves beautifully for four people. Homemade Ham Egg and Cheese Sandwiches (7 Weight Watchers™ Points per sandwich) – While I’ve found it easy to give up most fast food, I’ll admit that fast food breakfasts are my Achilles heel. Last year I set out on a mission to make a heartier, healthier version of a breakfast sandwich and am pretty happy with the result. My sandwich is significantly more filling than the one you’d get at McDonald’s but is better for you, particularly in the fiber department. These are easy to make, even on a busy weekday morning, and a reasonable alternative to the drive through. Whole Wheat Waffles (3 Weight Watchers™ Points per ½ waffle) – Waffles are a favorite in my house and I feel much better about making them now that I have a whole wheat variety that my family enjoys. This recipe uses yeast to compensate for the heaviness of whole wheat flour and to keep the waffles light. It’s also another recipe that you start the night before so breakfast the next morning is quick and easy. As you’ll see, the recipe makes 7 waffles, way too many for my family to eat at one sitting, but I make up a whole batch anyway and freeze the rest for weekday mornings. What are your favorite healthy breakfast recipes? I’m always looking for new ones to expand my collection and keep us out of a breakfast rut. Combine the milk, water, butter, honey, and vanilla in a small sauce pan. Heat over a low heat until warm, about 120 degrees. Combine the flour, cinnamon, nutmeg, orange zest, yeast, and salt in a large mixing bowl. Whisk to mix well. Add the eggs to the dry ingredients then pour in the liquid ingredients. Using a hand mixer set on low speed, mix the ingredients until well combined. Turn the mixer up to medium speed for the last 30 minutes of mixing. Cover the mixture in the mixing bowl and refrigerate for several hours or overnight. When you are ready to make the waffles, pre-heat your waffle maker and cook according to the manufacturer’s standard directions. I use white whole wheat flour to make these a little more golden in appearance. You can just as easily use regular whole wheat flour instead. Don’t let the liquid ingredients heat much past 120 degrees or they will kill the yeast. You can use a hand mixer or a stand mixer to make this recipe. You could also mix everything by hand – it will just take a little bit longer. This batter is more like light dough than a batter because of the yeast, so don’t be surprised when it doesn’t pour out of the mixing bowl as standard waffle batter does. I use a ¾ cup measuring cup to scoop the batter out of the bowl and pour it on the waffle maker. To hold cooked waffles while the rest cook, place a cookie rack on top of a cookie sheet, place in the oven set at 200 degrees. Place cooked waffles on the rack until ready to eat. While you could place the waffles directly on the cookie sheet, the rack allows air to circulate under the waffle to keep both sides crisp. You can add additional ingredients like blueberries, nuts, or even cooked bacon into the batter just before baking. These freeze beautifully. Let them cool on a rack, break them into quarters, and freeze. You can reheat them in the toaster just as you would an Eggo or other frozen waffle. Every waffle maker is different, so the number of points per waffle is directly related to the number of waffles your model makes with this recipe. If you get more or fewer than 7 waffles, you may want to recalculate the points for accuracy. If you stir additional ingredients into the waffles like nuts or bacon, they will increase the points per waffle and you may need to recalculate based on your specific ingredients. Love your breakfast ideas. It is the most important meal of the day! I love muffins and waffles for breakfast, but we’ve never done whole wheat waffles. I will have to give that a try. I’ve made a point to plan breakfast so I’m not left debating all morning what I want and not really eating well. It has definitely given me more energy! I love the idea of the make ahead whole wheat waffles! I’m going to have to make these and try them out on my nephew. He’s a waffle-a-holic. Thanks for the great ideas. I am a breakfast fanatic! My teenage son never gets out of the house in the morning without a great breakfast. These muffins and wheat waffles sound great. I’ll be trying them soon!! Yum! Thanks very much for linking to my blog carnival for Haiti! My favorite scone recipe is the Barefoot Contessa’s cheddar/dill combo. Instead of filling up on sugar, you get a nice savory treat that will hold you over until lunch.